Tell us about your process. What reference or influence (if any) do you take other mediums? My process starts by consistently carrying a camera and making photographs as a way to visually research and reflect on my surroundings. When taking and analysing these photographs I am able to find patterns in my observations and decipher larger projects to start working with from there. I only shoot on film to allow a period of time between taking and analysing a photograph, plus it forces me to spend time composing each single frame because of the added cost and the mechanics of analog cameras. I will then develop key concepts to focus, research and refine a project. The concept for this project was developed as I travelled solo through Europe at the mercy of my 20 year old car. I spent 5 weeks driving through Belgium, Netherlands, Germany, Austria, Italy and France covering 4,000 miles and crossing the Alps twice. Whilst exploring these various European landscapes I discovered a contemporary paradox to the process of exploration itself. I realised the desire to explore unfamiliar places was effected by my subconscious archive of imagery. This memory bank of imagery was made up from various sources; social networking holiday photographs, travel destination adverts, news footage and 3D computer mapping to name a few. As a result most places felt familiar to me before I had even been to them. After acknowledging this disconcerting condition of contemporary image sharing and digital mapping culture I began working with my camera to explore this notion. Death of the Explorer is not about specific locations relating to historical explorers and their discoveries, instead it is a comment upon the saturation of imagery in contemporary culture and the effect of this on the romanticised desire to explore and discover new places, our knowledge of the unknown. Are these pictures concerned with exploring formal and aesthetical interests – studies of form, colour, movement, how things work together, or are they representational, metaphorical? What is the weight that holds these pictures together? Death of the Explorer is a project concerned with the evolution of traditional maps, computer mapping as well as the distribution of imagery. When composing the photographs I wanted to reveal these vast landscapes textures and lines rather than attempt to capture a landscape image for beauty or any remnants of the sublime. The photographs reference traditional maps by being printed on light paper and presented in the form of a grid. This technique of photographing and printing attempts to expose every fine detail that was originally recorded on the negative. The final works require distance within the exhibition space. The fine detail and distortion within the image is only visible when viewing these works close up but when viewed from a distance the compositions and layers of the landscapes become most prominent. Are you a photographer or an artist using photography? The camera is another tool. When I have a new concept, I choose a tool. The image is often my starting point, but there are times when it seems more appropriate to approach an idea with a brush or a chisel. Does your work reflect on the medium of photography or the photographic image? If so, is that intentional? Death of the Explorer reflects on both the medium and the material object itself. It is a critique of our changing relationship to the ‘unknown’ areas of our planet and the roll that photography has played in this process. The materiality and processes involved with post-production aim to depict the maximum detail that was recorded on the original negative. 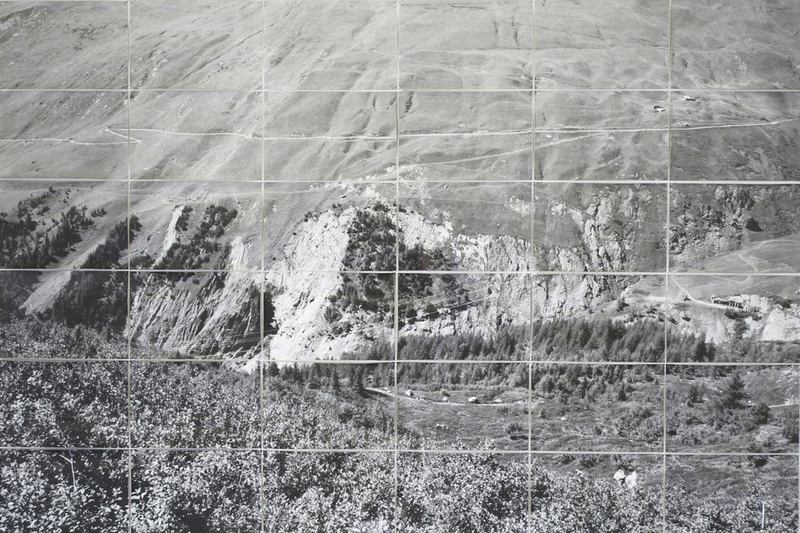 As a result of the works materiality, a two-dimensional photograph has taken on its own unique three-dimensional form. Typically, are your works more about construction or deconstruction? In general, I feel that my work tends to be about destruction, but to destroy something, the ‘thing’ must have already been created. So first I construct ideas and then reduce them until they are an optimum, or the minimum required to convey the concept. Death of the Explorer was no different from this. I spent 5 weeks constructing the basic imagery and idea for the project whilst driving and shooting, then many months scanning, editing and considering presentational techniques. Finally I reduced these pictures, concepts and presentational processes to a completed series of imagery. Are you interested in the notion of your pictures as objects? Do you think about how their physicality may endure as you are photographing them or is that an afterthought? I am conscious when taking photographs of the two-dimensionality of traditional photography, for me this is what is particularly magical about photography. This reduction or compression to 2D simplifies the 3D subject. I believe that it can create equality within its public by providing a fixed, uncompromised perspective for all. I feel that the final print of an image is very important to a final work of art, it becomes something that exists independently, it has a physicality and its own life as an object. Often sculptural photographic works are concerned with elevating banal objects, situations or events to a status of ‘art’ – when does something become art for you? It is art when the artist says it is art, for the materiality of art is no different from the materiality of what is not art.